Do you love the taste of fresh french fries or hot fried chicken? Almost everybody does, and that’s why fried foods are so popular worldwide. In an effort to make fried foods much more healthier, several appliance manufacturers have developed air fryers. Air fryers cook your food using hot air circulating around it instead of hot oil. As a result, there is much less fat and calories in food prepared with an air fryer. Sounds great, right? Well, maybe not. There are several claims that air fryers may be bad for your health, and some even say that they cause cancer! In this article, we’ll examine the evidence and see if there are any adverse health effects to using an air fryer. Does an Air Fryer Cause Cancer? Believe it or not, this is a common misconception concerning air fryers. The source of this fallacy is the concern over acrylamide in food. According to the National Cancer Institute, acrylamide is a substance that is found quite commonly in paper, plastics, drinking and wastewater, and has been found to lead to cancer in laboratory rats. When some foods are heated to temperatures above 248 degrees Fahrenheit, acrylamide is produced. The primary source of this substance is potatoes, which has led many to declare that french fries and potato chips cause cancer. Recommendations to reduce acrylamide in fried foods is to air dry them in a hot oven after frying in oil. If you fry your foods in an air fryer, you’ve got that covered. In short, cooking your potatoes in an air fryer not only does not cause cancer, it greatly reduces the risk of developing cancer from acrylamide compared to traditional deep frying in oil. Another benefit of an air fryer is that it helps you to control exact temperature and time to avoid overcooking. Eating foods that have been fried until dark brown may increase cancer risk. The UK’s Food Standards Agency recommends that people only fry, roast, bake or toast foods until they are golden yellow to avoid the risk. Just make you that you choose an air fryer that comes with an auto shut-off function. Check our air fryer reviews; all of the products in the list come with an auto shut-off function. Is an Air Fryer Safe for Your Health? 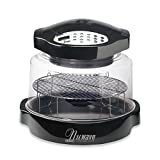 When you compare the traditional method of deep frying in a bath of hot oil to using a hot air fryer, you quickly recognize that not only are air fryers safe, they’re a much healthier way to fry any food. Instead of submerging your food in oil, in an air fryer you only give it a light coating of oil to allow the outside to get brown and crispy. That means that the level of saturated and unsaturated fats is reduced to nearly zero. The manufacturer of Philips Airfryer claims that its air fryer can reduce fat by 75% whereas T-Fal Actifry can cook all fried foods (up to 2.2 lbs) with only a tablespoon or less of oil. While some fat in your diet is good, most people consume way too much. Using an air fryer can help you maintain healthy fat levels in your body. Another benefit of using air fryers is that they can cut down on calories. Instead of being submerged in unhealthy and calorie loaded oil, your food cooks in a basket surrounded by hot air. That means that calories can literally drip off of your food as it cooks. A great example of this is chicken, where the fat literally melts off as it cooks in your air fryer. If you want to cut down on your calorie intake, using an air fryer is a great way to do it. Using an air fryer is good for your health and much healthier than deep frying your food in oil. Not only does it cut down on the amount of calories in your fried foods, it greatly reduces your risk of developing cancer from fried potatoes. Don’t believe all of the rumors floating around about air fryers, because they are the safest and healthiest way for you to fry your favorite foods.